Common tooth problems become all-too common for orthodontic patients. Although braces are an essential step on your path to perfectly-aligned pearly whites, the appliance in your mouth creates a breeding ground for bacteria, which can lead to several conditions if not controlled through appropriate dental hygiene. Your orthodontist will provide detailed information on how to care for your teeth while in braces, including how to brush and floss effectively. Even if your dentist has praised your hygiene habits in the past, you will need a more detailed approach when you are in braces. Gingivitis occurs when gum tissues become inflamed. If you develop this mild form of gum disease, you will notice that the gums become red, swollen and tender. Although gingivitis is not a serious dental condition, not treating it can lead to the more serious periodontal disease and eventually tooth loss. 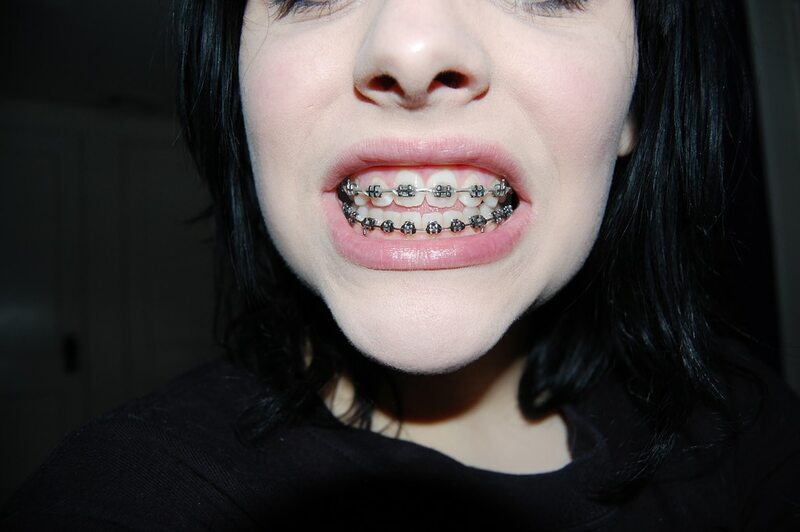 As with other common dental problems, wearing braces increases your risk of developing gingivitis. Fortunately, this oral ailment is not too tough to tackle. Cleaning the gums with proper brushing and flossing methods is a necessary start. However, most professionals will recommend adding an irrigation system, with the most popular brand being the Waterpik. Halitosis, the medical term for bad breath, is caused by an overgrowth of bacteria in the mouth. A lack of oral hygiene habits can contribute to bad breath, as food particles can accelerate the formation of bacteria between the teeth, around the gums and on the tongue. When wearing braces, patients are more susceptible to worsening breath because the bacteria in the mouth that cause halitosis have more to cling to. The daily preventative measures you should take will ultimately be most effective at controlling bad breath. These include routine brushing and flossing, but also may include tongue brushing and using a mouth rinse that kills the bacteria. If you have chronic dry mouth, your dentist or orthodontist may suggest using a saliva treatment such as Biotene. It is normal to experience some tooth sensitivity while wearing braces, but not too much or for too long after an adjustment. The pressure the brackets place on your teeth after an adjustment will cause some discomfort and sensitivity to temperature as the teeth are moving. If sensitivity lingers or becomes painful, other factors might be involved. Common causes of tooth sensitivity include over-brushing (brushing too frequently and/or pressing down too hard with the toothbrush), acidic foods and beverages, whitening products or teeth grinding. The first step in combatting tooth sensitivity is to address those potential causes. In addition, over-the-counter and prescription toothpastes exist that can combat tooth sensitivity. If no methods alleviate symptoms, the dentist can apply a sealant to the affected teeth. Tooth discoloration typically refers to the darkening of teeth due to a variety of factors. The color of the majority of your tooth is actually more yellow than white. It’s the enamel that gives teeth their glossy, pearly white appearance. A tooth can darken either because the enamel is stained (often due to habitual use of tobacco or certain food and drinks such as coffee) or because the enamel thins and exposes more of the natural tooth surface. Teeth also can develop chalky-appearing white spots that indicate the beginning of the decaying process. The white area shows where bacteria are beginning to erode the enamel, decalcifying the minerals in the teeth. White spots don’t form overnight – they result from an extended period of poor oral-hygiene habits. For braces-wearers, the problem is that brackets or wires can cover them, so they might not be visible until after braces are removed. However, the orthodontist is trained to look for white areas around the braces and often can inform the patient before they progress. Tooth decay is the process is that causes cavities — areas where plaque has eroded the tooth, creating a small depression or hole in the tooth that will grow over time if untreated. Cavities that are relatively shallow can require a simple filling procedure, which a dentist can complete in one office visit. Cavities that have been left alone to grow and deepen for long enough can require more extensive dental work, such as root canals or even tooth extractions. Orthodontic patients are at higher risks during their time in braces. Your braces make you more prone to plaque and tartar accumulation, which causes tooth decay. When you allow the significant buildup of plaque and the decay process to initiate, it means the orthodontist will have to do a lot more work to stick to your treatment plan, or maybe even prolong it. If you want to be in braces for the shortest possible time your treatment plan allows, follow all the hygiene instructions your orthodontist gives you. At Orthodontic Associates, our team of experts is prepared to diagnose and treat any dental problems that arise during your treatment. Call one of our nine convenient locations in the Baltimore area to see how you can begin your path to a perfect smile.